"A dash is a mark of separation stronger than a ​comma, less formal than a colon, and more relaxed than ​parentheses." 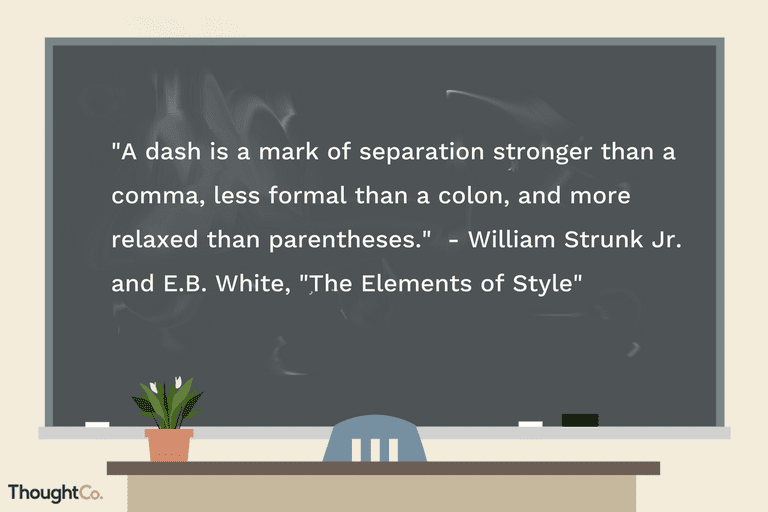 There are actually two types of dashes, each with different uses: the em dash—also called the "long dash," according to Oxford Online Dictionaries—and the en dash, which doesn't have another name but falls between the hyphen and em dash in terms of length. The en dash is so named because it is approximately the equivalent width of the uppercase letter N and the em dash is roughly the width of an uppercase M.
Merriam-Webster says the word dash comes from the Middle English word dasshen, which probably derives from the Middle French term dachier, meaning "to impel forward." One current definition of the word dash is "to break," which would well describe what a dash does in syntax. "The em dash...is frequently used in particular works as a substitute for the comma or for the colon, and is found particularly serviceable in rhapsodical writing, where interrupted sentences frequently occur." A sign of repetition in catalogs of goods, where it means ditto. In catalogs of books, where it was used instead of repeating an author's name. As a stand-in for the words to and till, as in chap. xvi. 13-17. The last use would today be an en dash, which indicates a range. She works from 8 a.m.–5 p.m. The festival will take place March 15–31. For your homework, read pages 49–64. Items of equal weight (test–retest, male–female, the Chicago–London flight). Page ranges (in references, “...Journal of Applied Psychology, 86, 718–729”). Other types of ranges (16–30 kHz). The crowd was Beyoncé Knowles–obsessed. To signal an abrupt change. To set off a series within a phrase. Before attribution to an author or composer in some formats. AP style calls for a space on both sides of an em dash, but most other styles, including MLA and APA, omit the spaces. On a Windows-based system, you can form an em dash on a keyboard by holding down the Alt key and typing ​0151. To create the em dash on a Macintosh-based system, hold down the Shift and Option keys and press the Minus key [-], notes Techwalla, adding that alternatively, you can press the Hyphen key twice and press Space. "Life, said Samuel Butler, is like giving a concert on the violin while learning to play the instrument—that, friends, is real wisdom." "Copper Lincoln cents—pale zinc-coated steel for a year in the war—figure in my earliest impressions of money." "The dash is less formal than the semicolon, which makes it more attractive; it enhances conversational tone; and...it is capable of quite subtle effects. The main reason people use it, however, is that they know you can't use it wrongly." —Lynne Truss, "Eats, Shoots & Leaves"
"The problem with the dash—as you may have noticed!—is that it discourages truly efficient writing. It also—and this might be its worst sin—disrupts the flow of a sentence. Don't you find it annoying—and you can tell me if you do, I won't be hurt—when a writer inserts a thought into the midst of another one that's not yet complete?" So, next time you look in your toolkit of punctuation marks and see the en dash or em dash just waiting to be put to work, ensure that you are using these marks for the right reasons and following the rules discussed. Ask yourself if your parenthetical remark will add nuance and insight to your writing or just confuse the reader. If it's the latter, return the dashes to your punctuation tool bag and use a comma, colon, or semicolon instead, or revise the sentence so that you can omit the dreaded dash.